E-Recovery is the data recovery application within the E-Prime suite of applications. In the event of early-terminated experiments, or lost or corrupted files, E-Recovery may be used to generate an E-Prime data file if the required TXT file is available. Versions of Windows provide varying methods of launching an application (e.g., Start Menu, Windows key, Shortcut/tile). 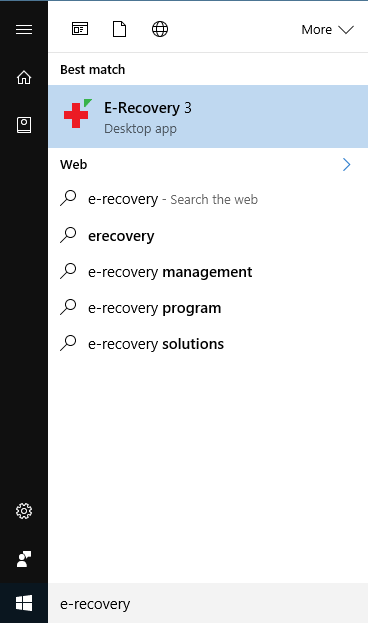 A Search window will open automatically as you type, and will list E-Recovery as soon as enough characters have been typed in to identify it. In the search results, click the application to launch it. Select the E-Prime .txt file to be converted to an .edat3 file by clicking the Browse button located within the E-Recovery dialog. 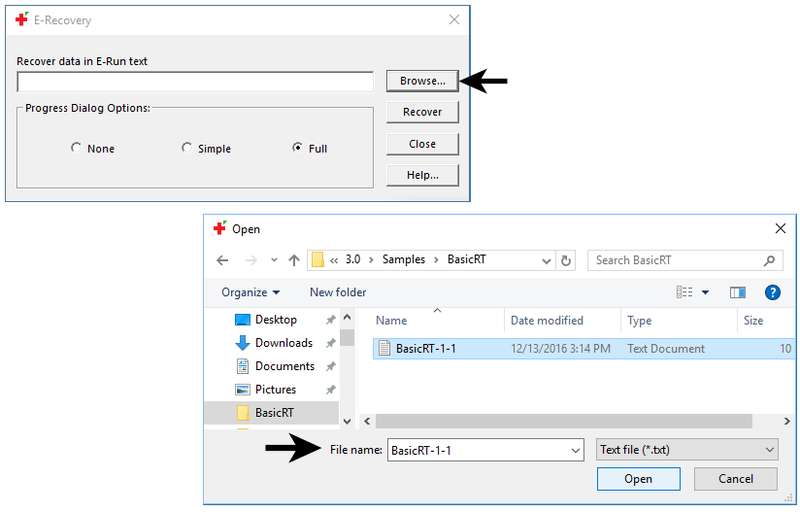 Navigate to the folder containing the .txt file, select the file, and click Open. Once the file is selected, the name of the text file will appear in the edit control. Use the Recover button to convert the data in the text file (.txt extension) into an E-Prime data file (.edat3 extension). The converted E-Prime data file will have the same name as the E-Run text file with the exception of the extension. The converted file receives the .edat3 extension. For example, if the E-Run text file is called “BasicRT-11-1.txt”, the recovered E-Prime data file will be called “BasicRT-11- 1.edat3”. Once the E-Prime data file is recovered, the data may be viewed using E-DataAid. E-Studio includes an optional setting to delete the .txt file after successful completion of the data file conversion to an .edat3 file. This setting is unchecked by default. In E-Studio, open the Experiment object’s Property pages from the Structure view. 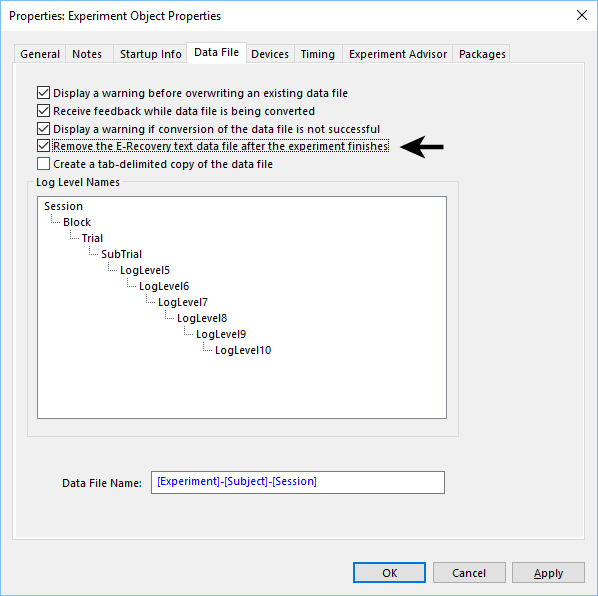 Select the Data File tab, and check the box preceding “Remove the E- Recovery text data file after the experiment finishes”. Click OK to accept the new setting and dismiss the dialog. E-Prime data files converted by E-Recovery will have an annotation in E-DataAid that indicates the session was recovered from an E-Run text file. This practice distinguishes E-Prime data files created using the E-Recovery program from files created initially by the E-Run application.